If you are not already familiar with David Lebovitz’s blog- well, you should be. 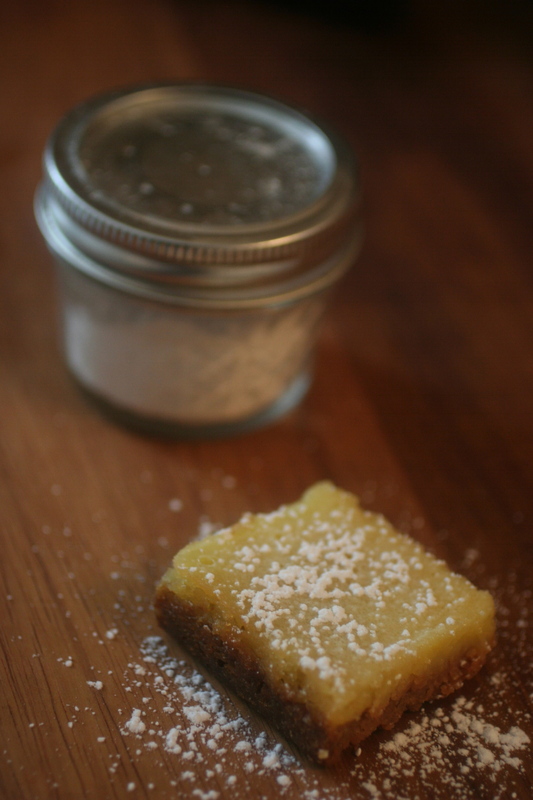 Growing up, I never really had a thing for lemon bars. But consider me a convert. I argue that this is the best recipe out there for them. The genius of it- is it uses a whole lemon- all food processed up- giving it super lemon flavor. I will not reprint the recipe here- but rather refer you to the original post on David’s blog. I had forgotten the deep shade of brown that the bottom crust turns- but was relieved to see David’s look the same—and they taste delicious and rich and not at all burnt. The other part of the post is a DIY project and challenge. Can’t remember the blog that I found this on last spring. But you know you are traveling with a treat- that will need a last minute dusting of confectioner sugar- and you don’t have or want to bring a sugar shaker. Don’t you just hate that? (ha!). Well, instead you can take a mini-mason jar, a hammer and a nail. And just hammer out some holes in the lid. I could probably stand to make a few more than I did- just to get more sugar pour out. Admittedly, I could also just invest in a mini-mesh strainer, which would probably work better and those cheap drain ones are like $1. But this is cute- and so very portable. When transporting, I keep place a non-punched lid over the other, so won’t spill. And here is the challenge. Because I am an over-user of mason jars- I think they are a great way to gift cookies. Anyone have ideas about good thing to gift bars such as these in? Looking for something as durable, portable and cheap as jars. Tins are great- but my stock ups from the Container store never last. And I’d love to repurpose something that is just laying around the house. Jess P. and I already starting discussing ideas of shirt boxes or cereal boxes— and my experimentation w. an egg carton was not so pretty. So I am asking you, dear reader. One more quick note about David Lebovitz. I might have mentioned from a previous post- but seriously, every ice cream I make is from him. Buy his book Perfect Scoop. 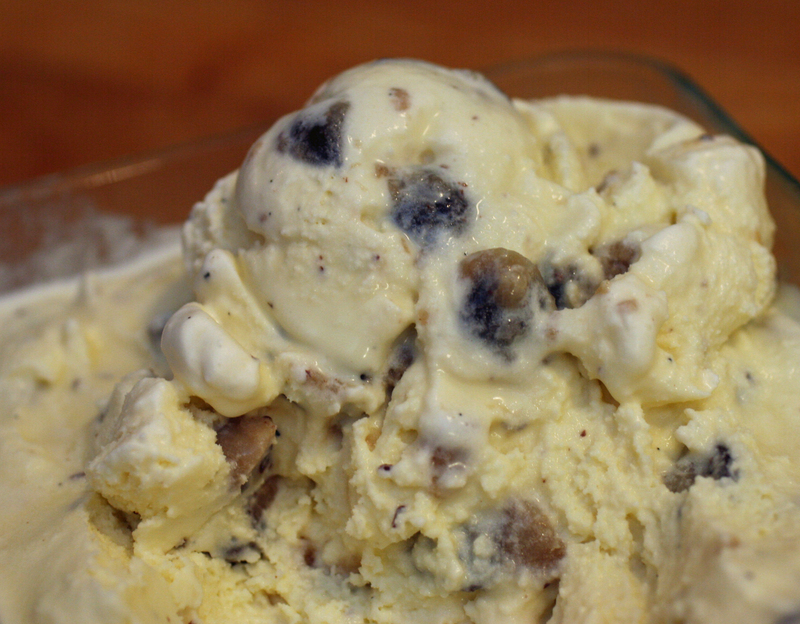 Most notably- some flavors I have made- but never published here- are a cookie dough ice cream- w. special dough just for it (sans eggs). A great chocolate base that I used for these s’mores sundaes (which i made in efforts to recreate this s’mores ben & jerrys ice cream sam and i ate too much of in high school. I can’t remember how i made the fluff- thats what i get for not posting sooner- but i think it was just a meringue base. yet another use of jars, shut up already tessa.) 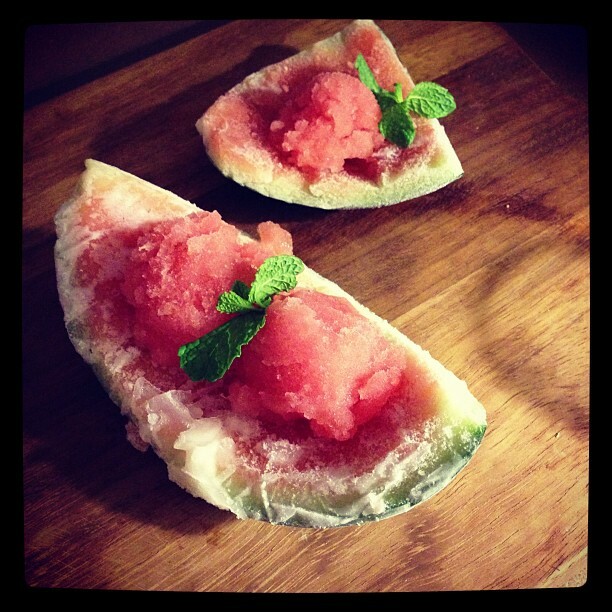 And watermelon sorbet. And while I am obsessing about him, love David’s egg salad too. watermelon sorbet. photo courtesy of Jordan K. I got all martha stewart when jordan and her BF alex came over for dinner- i froze the watermelon rinds to use as dishes. 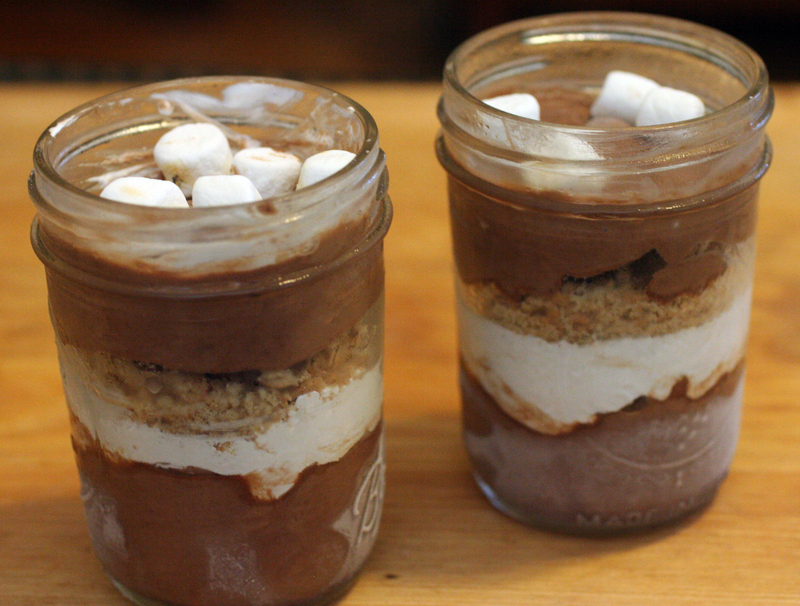 Smores jars look DELICIOUS! Perhaps a December babies dessert treat?! !